Stand upright and keep steady as the Scales of Heaven rise upward. Stand upright and keep steady as the Scales of Heaven rise upward. Humanity is poised at the precipice; maintain an emotional equilibrium or you may miss the opportunity to reconcile the past forever more. This week gives us earthbound occupancies a chance at contemplating a sense of balance, insights, and flashes of inspiration, a revelation may be very real! 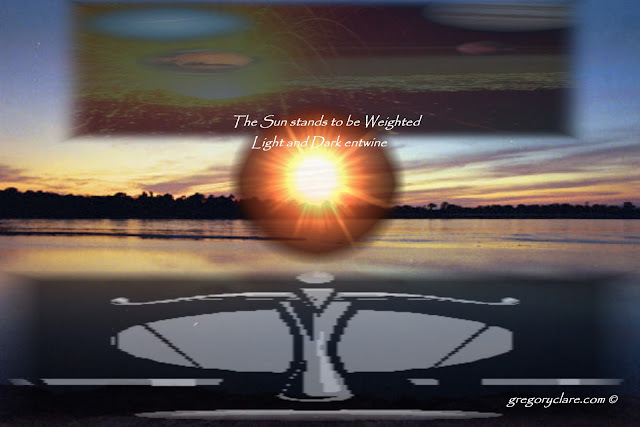 A chance to Balance your thought....weigh up, evaluate as the Air and Fire flicker from the deep canon’s of the earth. Hades has opened the gates!!! The Light will flicker from deep...make the most of this moment as you will be giving a glimpse from the fires below. This coming week September 27th 2011, there is a New Moon in the image of the Scales-Libra. This lunation is tilted heavily on one side of the scales with a stellium of planets occupying the Image. At the same time there is an equally fractional tension on the flanks. There is a-T-square involving Pluto- Uranus- Mercury-Sun/Moon. In Washington this Lunation is ascending with the dawn of light, Mercury/Moon/Sun/Venus and Saturn are on the Horizon. Uranus is Setting into night as Pluto stands at the stroke of Midnight. The chimes of Freedom are flashing as the Tolling of the Bells are heralded into the Light of Day. Your greatest chance of reconciliation comes as the Sun arises on October 7th, make the most of this day as; The Sun/Leaders will fall as Hermes stands at Gate Way to Justices. Kronos will be the judge of Karma on October 12th as those who have not payed the Ferry-man will not be giving the Keys to Freedom. The Sun stands at an Equatorial balance. During the coming weeks the Sun will enter the Image of the Scales, Libra. This can be seen as the weighing of Time, light and dark stand in the same proportional amounts. The entwining of two opposing forces. This moment is marked by the equinox and as such an Ingress chart can be used to understand the coming condition for the next quarter. This ingress event chart can be set for any place on earth and can be used in conjunction with the City or Nations natal chart to determine the prerequisite of the coming months, along with the monthly Lunation’s. The flavour or essence of this Libra Ingress and coming New Moon signals; a sudden application of effort, single-mindedness, an intervention. A powerful urge to act independently, but this energy will be driven by emotional responses, a release of nervous energy reserves and as such, care may be need in any undertakings as rash reaction may result in sudden unforseen calamities. By all means use this Time wisely, this is a Time to undertake any new projects, but do enter into any new venture with a Balanced and well thought through insight. Leaders, particularly Women will feel this Ingress more than Men.